This saturday it was the Fedora Release Party Panama due the new Fedora’s vesion “Heisenbug” and celebrating the 10 years of Fedora =). The meeting took place at Coworking-PTY starting from 2:00 PM. Informal talks about the new features in Fedora 20, and the Docker Project. Both talks were given by Abdel Martínez ( potty) and Alejandro Peréz (aeperezt) respectively. Before to start the conference we had a brief introduction to the Fedora Project. We talked about What it’s and how you people could integrate and help. It was inevitably that ARM became a primary architecture when today we a have a lot users acessing to internet and perform their daily activities through mobile devices, tablets, small computers (Raspberry Pi, Cubietruck). Now, Fedora offers installation images with different desktops (XFCE, GNOME, KDE) on ARM architecture . Users can add, edit, among others related to these options using the command-line tool nmcli. Fedora 20 comes with the latest GNOME version, the 3.10 and includes an awesome application manager. Sendmail and syslog not come installed by default, improving performance. For developers comes with Ruby on Rails 4.0, 5.18 Pearl, among others. Hadoop integration with Apache is also included. Futhermore, Alejandro talked about that may or will be the replacement of virtualization concept: Docker, that’s a creation of containers (LXC) that allow us (due to their light weight compare to the VMs ) share computer resources on the native operating system. What are the advantages? Having access to the computer hardware that is not currently possible with a virtual machine, install a Linux distribution such as: ubuntu and run it under the Fedora kernel, among others. So you can create multiple containers that share resources between them. Imagine, how much space you can save by using n bins rather than install n VMs? Applications where Dockers does the magic? Creating sandboxes. When you’re not sure about what will happen, then you create a sanbox and you make sure that the settings keep there. No need to create a virtual machine, wait endless hours to load, anyways. Containers also allow you to install applications only for a specific container without compromising the others. Another application that Docker provides is using containers for group projects, allowing to do all the test and the development. For more information visit the official website docker. 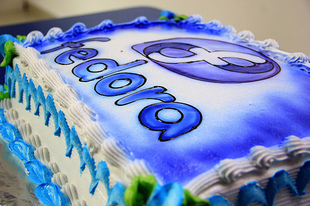 Fedora Release Party wouldn’t have been possible by the Fedora community. Thanks to Mónica Mora for pictures and to the speakers for their great contribution.